Easy. Cheap. Adorable. How can you pass up something like this? I found places online where they sold the tutorials on how to make these glass pendant necklaces. Here’s mine for free. If you make something using this tutorial, please upload pictures of it in our Flickr group to show it off to everyone. You may be featured on Simply Modern Mom. *glass pendants and bails can be found pretty much anywhere online… Amazon, Etsy supplies, etc. I have also found bails at craft stores. 1. Using the exacto knife, cutting board, and ruler, cut your papers to the size of your glass tiles. 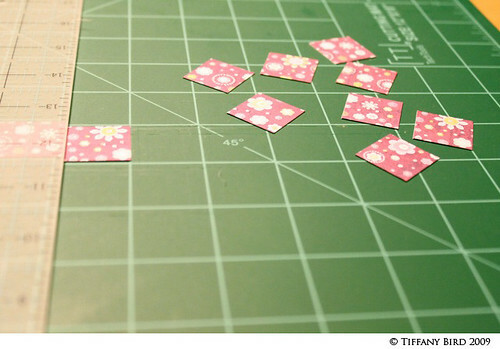 I prefer to cut my papers slightly smaller than the tiles (about 1mm shorter all the way around). I had squared tiles, so I rounded the corners of my paper a bit to fit the tiles better. You can use just about any kind of paper, although tissue paper may be to thin and transparent. Suggestions: magazine pages, scrapbook paper, origami paper, cardstock. 2. 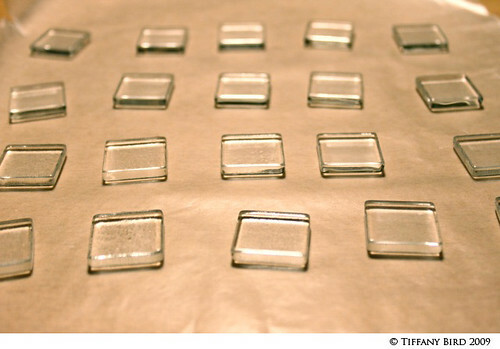 Clean the glass tiles with a slightly damped paper towel or cloth. Allow to dry completely. 4. Quickly wipe off excess glue with toothpick and dry paper towels. Turn the tile over and press down on the glass tile hard to allow the layer of glaze to even out. Allow to dry completely, approximately 30 minutes to an hour. 5. Working on the back side of the pendant again, put another layer of glaze over the back of the paper to seal it. If you are using the Diamond Glaze, you will only have to do this once. If you are using Mod Podge, you will need to use a brush and do a few coats allowing drying time between coats. I also applied glaze on the sides of the paper to protect the edges. Use a toothpick and paper towel to wipe off excess glaze or glue. Also use the toothpick to pop any air bubbles in the glaze. Let it completely dry, approximately 5-6 hours or longer. 6. Once it dried, clean off any excess glue anywhere on the glass tile with a lightly damped paper towel or carefully scratch it off with finger nails. 7. Glue bails to the back of the pendants at the top. 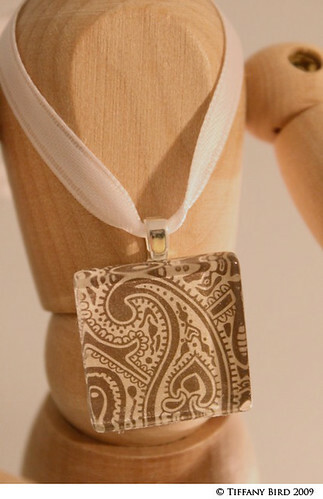 Make sure you check your designs and note which side you would like to have as the top of the pendant. 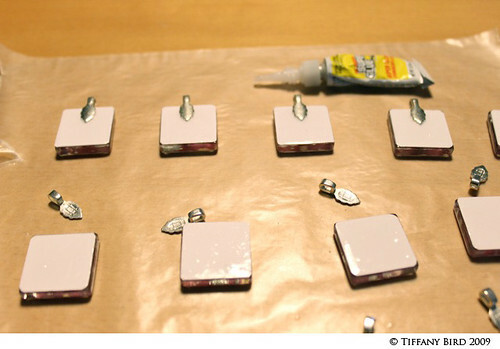 If you use super glue, apply a small amount of the glue to the back of the tile and the bail. Work quickly as it dries fast. You will also need to get it right the upon first contact because super glue doesn’t allow much time for adjustments. If you use E6000, squeeze a pea size onto wax paper. Then use a toothpick to apply a small amount of it to the back of the tile and on the bail. 8. Let it dry for about 30 minutes to an hour. 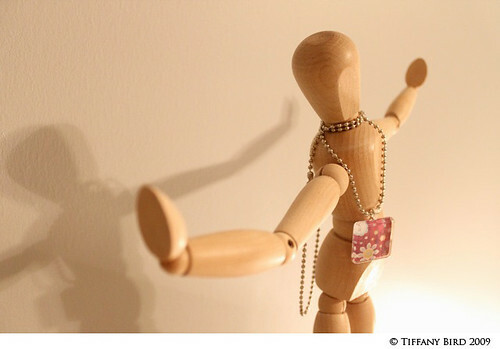 Then put on ball chains, ribbons, or necklaces. These are great Tiffany! Thanks for showing us how to make them! Those are great – I’m going to have to give it a try! So cute! Did you find a place around here that sells Diamond Glaze? I found it at a local JoAnn Fabric store. Thank You For the clear step by step tutorial with beautiful photos! These are beautiful and so easy. What great Christmas gifts these could make. Thank you!! I’m excited about trying these! 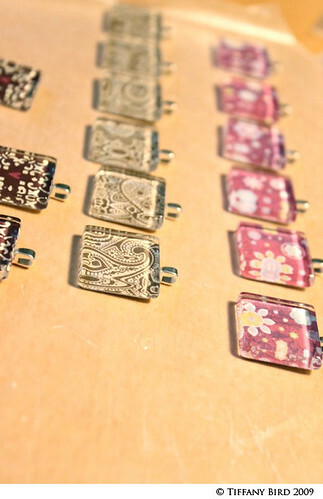 Would love to try the glass tile necklace – where did you find the tiles at a reasonable price? search etsy supplies. there are some sellers there with great prices. BEAUTIFUL — I love this necklace. 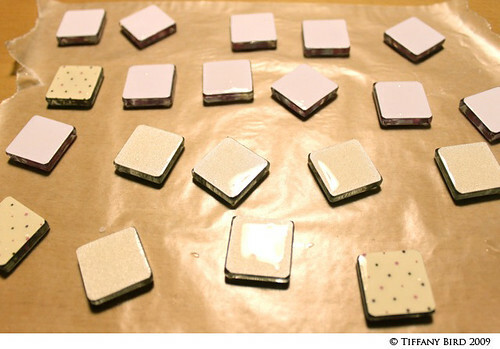 Did you find the glass tiles locally or buy them on Etsy? thanks rachel! you have a lovely blog! Did you find out if these are waterproof? No, diamond glaze isn’t waterproof when cured. It would be best to avoid exposure to moisture. 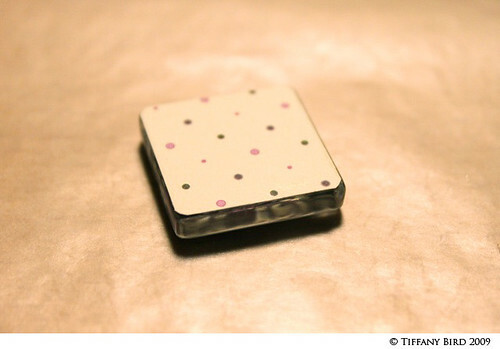 Tiffany~ Your work is AWESOME…Love it!…Thanks so much for sharing this gift with everyone! These are wonderful! Thank you for the tutorial. I love these. I am looking to do this for a Mother/Daughter activity. What size are the tiles in your example? Thank you! Can you tell me where you find the square glass tiles at? 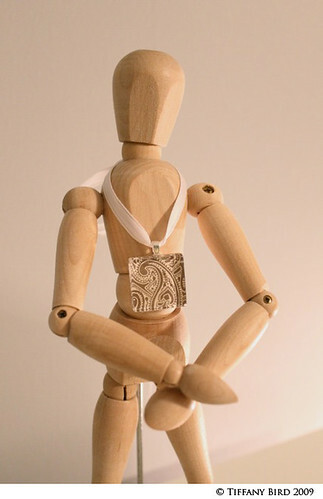 I LOVE your designs and I am sooooo wanting to make these-when I do I hope they turn out as GREAT as your did. THANKS for sharing! i ordered mine from etsy. however, i have seen some in craft stores such as michaels. hope that helps! I’m a photographer and was curious how the glue works with photo type papers? Will it make the ink smear? i don’t really know. i have never tried it with photography paper before. so it is ready to glue to the glass tile. I’m using Diamond Glaze and my problem is: there are marks of unevenly spread glue left between photo and cabochon, and they are really vivid in certain angles. I tried pressing the paper hard to eliminate those, but it doesn’t work; also, I tried coating the paper with a thin layer of Diamond Glaze first, and then, after it dries, sticking a cab again with DG to it – it proves to be better, but there are some marks also visible. any solution to get rid of those? I tried making these and in addition to the diamond glaze looking uneven, the image looks really “foggy”, not clear like yours. Any suggestions as to what caused this &/or how to fix it? Thanks. are you using photos? i’m not sure how the diamond glaze will do with photo type paper. I want to have a girls night and make pendants with some friends. I think they will make great teacher gifts! If we glue the bails on after 2-3 hours of dry time, before they are completely dry, will it ruin the pendant? Thanks! I’ve made about 30 of these so far with different designs. Everyone loves them. I’ll try to post a couple photos — not sure how, though. I’ve added a step: I glue (using Diamond Glaze) a piece of pretty paper to the back before adding the final layer of glaze. My daughter (age 8) and I made these today! I can’t wait to give them out as Christmas Presents — everyone is going to love them! wow very cute, my daughter will love it!